Alex was drawn to animals at a very early age, fascinated with their appearance, behaviors and natural abilities. At the age of 5, Alex had his first dog and quickly discovered the very special bond that dogs are able to develop with humans. Just like the first wolf that approached the campfire and ate from a human hand, the modern dog shares this ability to form an unbreakable, lifelong bond with humans. Alex’s training career started at Miami Seaquarium as part of their training staff. Here, he had the opportunity to work around world-renowned marine mammal trainers and was able to understand the fundamentals of conditioning and behavior reinforcement to create a bond between animal and trainer. Shortly after this, his strong passion for training animals led him to train canines and he began working in one of South Florida’s premier dog training companies. Alex was trained amongst multiple veteran dog trainers, allowing him to learn a wide range of training styles and philosophies that helped to shape his current unique training style. 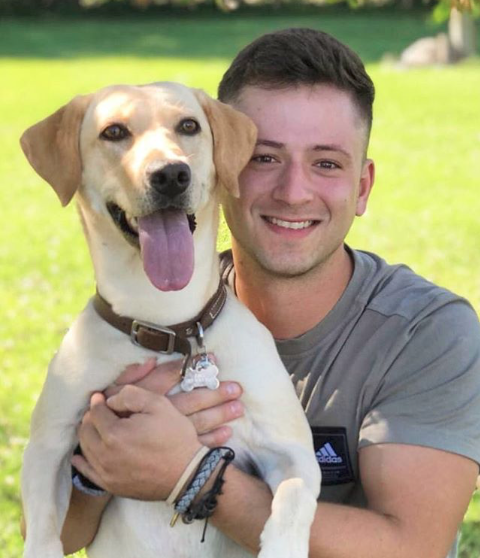 Through studying and observing dogs closely, Alex was able to learn canine body language – a universal language that allowed him to determine the needs of the dogs he trains and inform and educate the owner. This is one of the attributes that make Alex such a successful trainer, as he is able to understand and interpret everything the dog is trying to communicate through keen observation and experience. At AV Dog Training, our pack specializes in obedience and behavioral training with an emphasis on owner education. Our team upholds the most professional service while spreading a message of love and understanding between owners and their pups!